Make Caramel Corn and Chocolate Corn in your Whirley Pop ™! FRESH WARM CARAMEL CORN and Chocolate is a special treat that in the past has been a multi-stepped recipe taking over 1 hour for each batch. EASY AND FUN TO MAKE; GREAT TASTING SWEET TREAT. 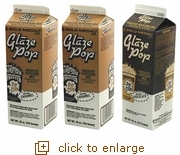 One package is enough GLAZE POP for approximately 5 to 7 batches. Not a significant source of saturated fat, trans fat, cholesterol, dietary fiber, vitamin A, vitamin C, and calcium.